WordPress image optimization is one of those things that’s useful for anyone who blogs regularly (be it weekly, bi-weekly, daily, or however many times). Including images in your posts is usually considered a good thing, but as you start to do so over time, you’re going to end up utilizing storage space on your server. On top of that, sometimes images include metadata that isn’t always necessary for images posted on a site. For example, the time, date, and location of a photo isn’t always necessary to keep when sharing an image on the web. Sometimes, sure, but all the time? Doubtful. Anyway, there are a number of great plugins that are available that compress images, remove metadata, and generally help with all of this. One of the one’s that I’ve been using and that I’ve grown to really like is Optimus. 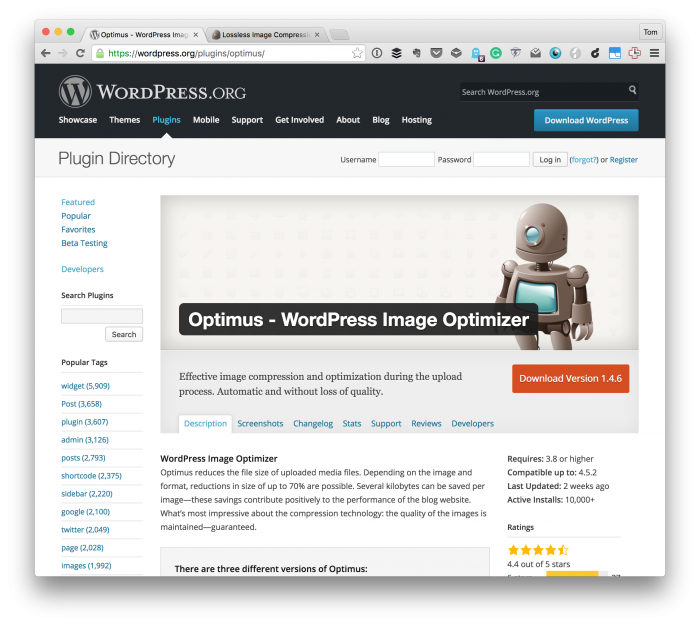 Optimus is a WordPress image optimization plugin that’s available in the WordPress Plugin Repository. Optimus reduces the file size of uploaded media files. Depending on the image and format, reductions in size of up to 70% are possible. Several kilobytes can be saved per image—these savings contribute positively to the performance of the blog website. What’s most impressive about the compression technology: the quality of the images is maintained—guaranteed. And though I’ve not combed through each image with the proverbial fine-toothed comb nor gone to deeply examine the end result, I do know the filesize is smaller and it appears to be a great lossless compression algorithm. There are a few versions of the plugin. Free works with a maximum of 100kb. HQ works with additional functionality ideal for personal projects. HQ Pro is designed for larger projects and agencies with customers. You can see a breakdown for all of this and the features on the product page. Over the last month, I’ve been using it on a small, though an image intensive, blog. After using it for sometime on another blog and then using it on this blog, I’ve been really happy with the results. Before talking about how it’s worked out for me, it’s worth mentioning that when I first tried using the Pro version, I was having problems with the software actually working on larger images. These were either large images that I’d taken or large images from other sites (freely licensed of course). Part of this is that some of the images I was using were simply large, the other part of it that I was trying to put a plugin through it’s paces. So when I kept running into an error when uploading images, I contacted support. I received a response in roughly a day with a fix shortly thereafter. Since then, it’s been good. The plugin offers an easy-to-use settings page. setting whether or not optimization should occur during upload or not. Finally, the plugin also provides a feature to optimize all existing images (or a bulk image optimizer). So even if you just start using the plugin today, you’ll be able to update all of your images retroactively. 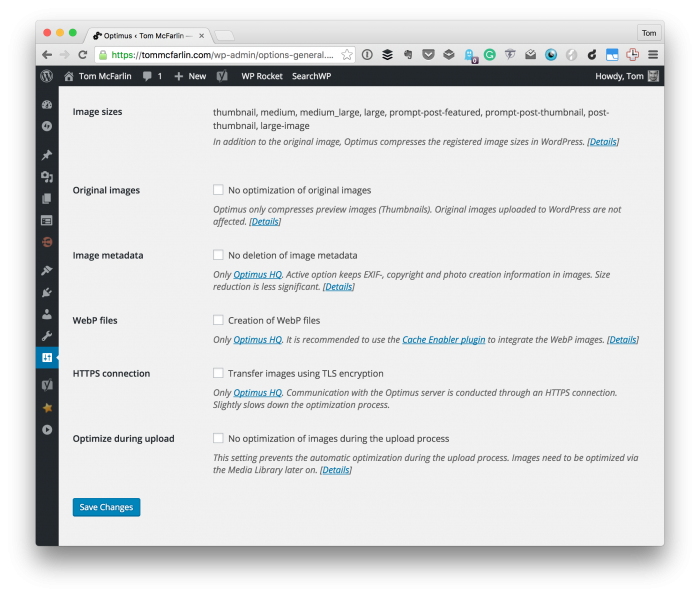 There’s a lot of options when it comes to working with image optimization in WordPress (which I consider a good thing). Aside from the features listed above, one thing that really won me over for this plugin was the customer support. Being able to shoot and email, get a quick response, and have an update pushed out in a reasonable amount of time (which I actually consider to be a week or two for some companies, for whatever that’s worth) makes it all the more useful. 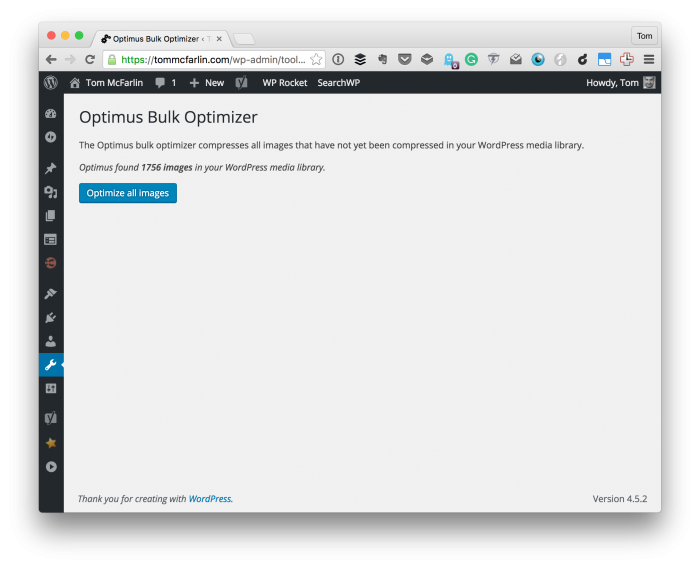 So if you’re a blogger who uses images of any type on a frequent basis and you’re looking for an inexpensive solution, then I recommend Optimus. I appreciate your blog and the information you provide. That said, I want to encourage you to always have a look at the 1 & 2 star reviews of a plugin, like Optimus. Especially the most recent negative reviews. There’s alot more value you can add to your plugin reviews if you bring out some of the valid complaints, and attempt to provide some solutions, or at least comment about them. There’s alot of people out here who don’t have the kind of expertise you do, and could use a helping hand, or at least a “heads up” warning if required. Thanks for the comment! I’ll try to touch on each of your points. I do. If I see a plugin that has something like Optimus of 10,000 downloads and only 4 – 5 one-to-two star reviews, then I normally ignore them. It’s not that they don’t matter, but it’s that it comes out to be such an insignificant percentage of feedback that it’s negligible. I also don’t know the user’s set up and they often complain about things that aren’t necessarily representative of feedback. For example, one user complained that an approximately 12KB image compressed to 11KB. That’s already extremely small to start with, but if you were to contrast that with an image that was megabytes in size, then it’d give you a clearer idea of the savings that you have. This isn’t me trying to be dismissive of their feedback, but it’s that their tests aren’t as accurate if they are working with images that small to begin with. This is a valid point. I usually try to reserve my recommendations based purely on my experience and I try to be as upfront about that as possible (even sharing the hosting environment and other tools I use on other posts and the about page on my website). But given that others don’t always read those pages, I think that’d be something valuable to add to each post like this which I can easily do for future write-ups. This is another thing that I think would be worth mentioning. I don’t do sponsored reviews so I tend to write solely based on my experience. If the articles get too long, they become like reviews and they end up almost looking like they are sponsored posts. Perhaps that’s an avenue that I should go down for certain plugins like this (that is, if they are premium). Either way, I’ll give some thought to this and find the best way to tackle it so I’m not doing a full-fledged review, but I’m not leaving out critical details. Good thoughts, Dan. Much appreciated. I’ve been on the hunt for a good WP image optimizer plugin, and I’ve noticed that most are priced based on number of images optimized, which is cost-prohibitive in my case (and I’m sure may others), as I manage multiple client sites, some with large media libraries. I like that the pro version is a flat fee for all your sites. I’ll definitely try this one out!